The Musselman's Apple Sauce Family Skating Tribute took place on October 9th, 2014 at the Pegula Ice Arena in State College Pennsylvania. This was the second year in a row that my husband and I were invited to attend the event courtesy of Musselman's Apple Sauce. The music entertainer was Amy Grant and the TV Hosts were Kristi Yamaguchi and Michael Weiss who both hosted the event last year. It was really nice to see them both back again this year since they are two of our favorite ice skaters. The Pegula Ice Arena is fairly new...I believe it was built and opened back in 2013 and is quite large. It sits near the Bryce Jordan Center and is not far from Beaver Stadium where Penn State plays their home football games. Parking at times can be a nightmare but since I am handicapped, we got close parking to the arena. The show was taped and will air live on ABC on Sunday November 23rd, 2014 from 4pm to 6pm EST and on Sunday December 7th, 2014 from 4pm to 6pm EST. We will be watching!!! Hubby and I are big professional ice skating fans and were excited to be attending the event for the second year in a row. 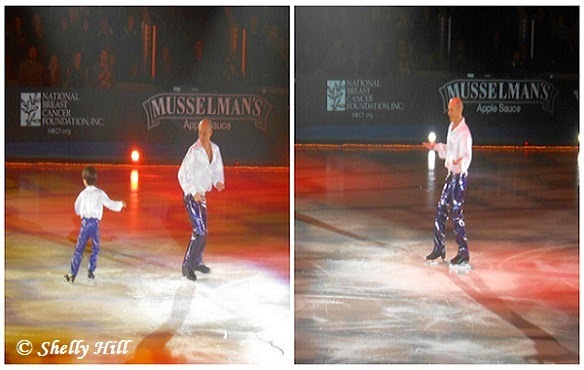 I have always been a HUGE fan of Kurt Browning and was super excited to see him perform again this year. Matter of fact, he was my favorite performer because he skated to Brick House which is one of my favorite performances he has ever done. One of his little boys even joined him for the performance! Throughout the event Amy Grant was singing live to some of her biggest hits and since my mother and husband are huge Amy Grant fans, they really enjoyed hearing her sing. I have to admit, I am now an Amy Grant fan too! She was awesome! The show last about 3 hours in duration and they had a nice 20 minute intermission halfway through so you could get up and move around. During the intermission, the Penn State Figure Skating Club came out and performed to keep guests entertained. After the event there was a VIP party and mingling session and since we were VIP guests courtesy of Mussleman's Apple Sauce we were able to meet and greet with the performers. That was really cool and an experience I will never forget! We hope that the Family Skating Tribute continues for next year and if it does...we will be in attendance again! We had a great time and highly recommend this family-friendly activity to all of you. Thanks Musselman's! Disclaimer: We were provided with 3 complimentary tickets to attend the Musselman's Apple Sauce Family Skating Tribute and 3 complimentary VIP wrist bands to attend the after-party meet and greet from Musselman's Apple Sauce. You can click on the photos in this blog post to enlarge them to see the details up close and personal.